A few weeks ago Jon Peters, our Uftring Auto Group Director of Fixed Operations, was interviewed on Good Company. His topic? 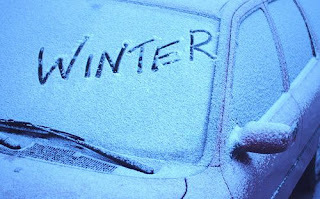 Preparing your car for the winter. Well, the winter is definitely upon us now! If you haven't done so already, now is the time to get your car up to the winter code. You can watch the full interview by playing the video below. 3. Battery - Have your battery checked. This is typically free of cost. 4. Belts and Hoses - Have these checked. They carry the coolant, which keeps your engine cool and your heat hot! 5. Tires - tread depth and proper inflation are crucial. You lose 1 pound of pressure for every -10 degree drop in temperature. 6. 4 Wheel Drive - If you have this on your vehicle, test it out now to make sure it works when you really need it. 7. Antifreeze - A 50/50 mix of water and antifreeze is the way to go. 8. Emergency Kit - in case something goes awry on the road it's a great idea to carry an emergency kit. Watch the video for more tips and details on these topics. You can always visit an Uftring service center for any battery or equipment checks, oil changes, tires or other parts that you need. Please prepare your car and drive safely this winter!